And they get all Qaeda with us! I'm sure! Once again, the confusion of Al Qaeda with Al Qaeda in Iraq goes unchallenged. Should we be keeping score somewhere? Today, my wife passed her second and final exam to qualify as a licensed Marriage and Family Therapist. Today, an as-yet unidentified gunman killed 32 people (the current count) at Virginia Tech. It's impossible not to juxtapose those two pieces of news. As a country, we've never fully recovered from the 1999 Columbine massacre. While we may not still grieve, schools still enforce all kinds of anti-violence measures with the same earnestness and occasional brainlessness of the post-9/11 Transportation Security Administration (TSA). School authorities tolerate no violent talk, just as TSA employees give you no choice about taking off your shoes. It's highly dubious whether either measure makes anyone measurably safer, but these are the sort of easy, obvious responses that any administrator would embrace. Effective solutions to the risk of mass murder require more work, expertise, and time. 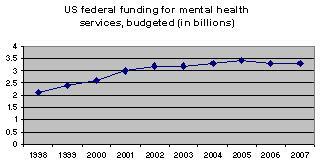 Here's a graph of the money that the US federal government has budgeted for mental health care, distributed as block grants or in other forms. What you see isn't exactly a direct response to the Columbine massacre. Instead, it's a measure of how much your elected representatives put a value on mental health care in general. These figures come from the Department of Health and Human Services' yearly request for funding. However, funding at the federal level is a poor measure of how money really gets spent, or how effectively we are taking care of the mentally ill (and potentially dangerous). What happens at the state and county levels is far more important. Those are the strata of our federal system where we run our prisons, employ our juvenile case workers, and fund our mental hospitals. The story in California, where I live, looks a lot like the rest of the nation. Here's a study from 2005 that tells the by-now familiar story. Caseloads are rising. The per capita amount of time allotted to those in need, such as the "troubled teens" that have scared generations of Americans, has dropped. Fewer preventive services are available. Therefore, many of the mentally ill end up in prison, instead of treatment. Insurance that provides mental health coverage is shrinking, shifting the burden further to county and state governments. In spite of the immediate risk that a mentally ill person may hurt himself or someone else, most Americans don't feel threatened. Even when something truly terrible happens, such as the Colombine massacre, we don't feel moved to act on the scale that the US government has since 9/11. Meanwhile, we encounter the mentally ill all the time, on the streets, in our schools and workplaces, and sometimes within our own families. Mental health services, from therapy to medication, are imperfect mechanisms. Not every medication works with every patient, and not every patient reliably takes their medication. Therapy doesn't always work, and to work, it takes time. At the same time, Americans ask far less of the Department of Homeland Security and other agencies involved in counterterrorism. (If you look at the rate of terrorist convictions, the government's scorecard for counterterrorism looks a lot worse than mental health services.) We feel more threatened by foreign terrorists, even though we're more likely to fall victim to crime at the hands of a mentally ill person. The Department of Homeland Security is a bloated embarrassment, gorged on the public trough, too lazy to be bothered to explain why it needs so much and does so little. American voters shrug, and continue to hand over their shoes and toothpaste in the security line. As of this writing, I don't know who killed 32 people at Virginia Tech, or why. Maybe the person was a paranoid schizophrenic, a psychopath with a gun, or just an evil person. I do know that America's collective perception of danger doesn't always fit reality. Government, as conservative critics have often been right to point out, isn't always the solution. On the other hand, budgets are where we show what we really value, because we're willing to spend money on it. A while back, I likened counterterrorism to campaigns against organized crime. The terrorist and the mafioso have a lot in common, including increasing business between them. This recent research paper, co-authored by one of the guys at Counterterrorism Blog, goes into further detail about these connections between terrorist cells and criminal organizations. Officials in the Moroccan government genuinely convinced their American counterparts that they would have more success with Tabarak. The Moroccans have their own reasons to interrogate Tabarak. In 2003, Al Qaeda bombed, within a few minutes of each other, several targets in Casablanca. The terrorists behind the Madrid bombings also used Morocco as a base and transit point. Tabarak was never as important as the phrase Osama bin Laden's bodyguard implies. Every terrorist organization employs people--some may know the group's real activities, others may not--in a variety of minor support roles. Not every one is worthy of elevation to Bond villain status. Tabarak struck a deal, exchanging something of value for his freedom. The interrogators at Guantanamo Bay ran out of reasons to hold Tabarak. Of course, none of these motives are mutually exclusive, so there's undoubtedly some mix of them at play. The Moroccan government has its reasons for asking for Tabarak; the US government has its reasons for letting him go. The bombings in Jordan represent one of the scariest escalations in the two violent years since the invasion of Iraq. The invasion opened the door to Abu Musab al-Zarqawi, once confined to operating as a leader in Ansar al-Islam in the northern corner of Iraq, to operate on a much larger stage, against a ready-made supporting cast of American adversaries. Without asking permission from the Al Qaeda leadership, he christened his new organization Al Qaeda in Iraq, instantly gaining the cachet of the world's most notorious network. Jordan is one step away from Israel, already beseiged by the second, more bloody intifada. The majority of the Jordanian population is Palestinian, which instantly suggests the question, Were any Palestinians involved in these attacks? The attacks are designed to send the message that peaceful, stable, and moderate regimes cannot provide safety to its citizens. The attacks may also be an attempt to lure the United States into becoming more entangled in the politics of neighboring countries, to the detriment of the overall American war effort. In this respect, Al Qaeda in Iraq may be trying to construct as messy a regional war as the US faced simultaneously in Vietnam, Cambodia, and Laos. The attacks may backfire. In fact, they may already have. Jordanians have already turned out en masse to denounce the attacks. The one operative captured, Sajida Mubarak Atrous al-Rishawi, may have information that can be used against Al Qaeda in Iraq. However, there may still be a great deal of justifiable anxiety in Amman, Tel Aviv, and Washington--not to mention Cairo, Riyadh, Ankara, and other capitols. Herr Professor Taylor pointed me in the direction of this article, in which another blogger explains why he didn't post a 9/11 remembrance. It's worth reading. I didn't post anything myself, and I changed my mind about explaining my rationale after reading Wordhoard's piece. 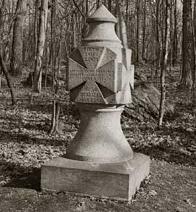 I didn't post anything on Sunday, and I'm unlikely to ever again in the history of this blog, because, after four years, I think we can honor the dead without turning that day of horror into a perverse fetish. In fact, I think it's time that it's incumbent upon us, as US citizens, to do exactly that. No one's feelings are in jeopardy if we don't memorialize 9/11 every year. On occasion, I still weep over the dead. I knew one of the most famous victims, Todd Beamer, through work. For others, I still feel the bonds of grief and outrage over the lives snuffed out because a handful of fanatics decided it was time to teach the United States a lesson. Unfortunately, the people who were the subject of this "lesson" were innocents--most Americans, but many not--who were just trying to get their work day started. I also want to keep 9/11 in perspective. It wasn't the "day that changed everything." It was the day that a small group of clever terrorists got lucky. I don't want to hand them the power to transform my civilization, my nation, and myself. Taking political advantage of a mass murder is just wrong--whether you're last name is Atta or Rove. For a while, Remember 9/11 was a way many people got through a national tragedy through collective determination. It was a poorly-phrased slogan, however. Like Support Our Troops, Remember 9/11 is stated as an imperative, not as a declarative sentence. I already support our troops, and I definitely remember 9/11. I don't need to be reminded--and, I assume, neither do you. As a nation, it's more important what we do in 2005 and beyond, not what we say. Because of the success of US counterterrorism efforts, Al Qaeda has increasingly depended on the Internet as a tool for recruiting members, discussing possible operations, and sharpening its terrorist doctrine. The Web's shapeless disregard for national boundaries and ethnic markers fits exactly with bin Laden's original vision for al Qaeda, which he founded to stimulate revolt among the worldwide Muslim ummah , or community of believers. Bin Laden's appeal among some Muslims has long flowed in part from his rare willingness among Arab leaders to surround himself with racially and ethnically diverse followers, to ignore ancient prejudices and national borders. In this sense of utopian ambition, the Web has become a gathering place for a rainbow coalition of jihadists. Of course, not all the Islamist revolutionaries swapping notes on the Internet seek the same revolution. In fact, they often use the opportunity to denounce each other's Koranic interpretations, critique \how a particular rival is being too nationalistic or internationalist, and sneer at the outcome of a rival group's operations. However, they also do genuinely collaborate in what one observer has called "the open source model" of revolution. Given how easy it is to disguise your location or identity on the Internet, going on the "cyberwar" offensive by blocking Islamist web sites would be pointless. What would be a worthwhile endeavor, however, would be to hire as many Arabic speakers as possible to monitor these sites. Better to take advantage of terrorist discussions that are out in the open than driving them undergroud. And let's not kid ourselves that foreign Islamists are the only terrorists with an Internet footprint to follow. Domestic terrorist groups--white supermacists, militant Christian millennarians, and the like--also use the World Wide Web for external and internal communications. Revolutionaries since the Protestant Reformation have been eager "early adopters" of mass communications--including the Internet, long before the first airliner hit the World Trade Center. All Things Considered has a brief interview with Marc Sageman, author of Understanding Terror Networks, about the links between Al Qaeda and the groups behind the recent bombings in Egypt and Great Britain. I think the headline on NPR's web site, "Are Freelancers Co-Opting Al Qaeda's Name?" is a bit off the mark. Still, the important point is understanding the loose but effective relationships between Al Qaeda and its "clients." Another thought about the second London attack: It definitely seems like that group was far less competent than the group responsible for the first, highly lethal bombings. Sometimes Al Qaeda's investment in a group pays off; sometimes, it doesn't.